From the NBC10 Boston Weather Center… Overnight Friday Night: Showers, mountain snow. Lows in the 30s. Saturday: Turning sunny and mild. Highs in the 60s. Sunday: Pleasant and mostly sunny with sea breezes. Highs in the 50s coast, 60s inland. Cape Cod Radio Forecast Overnight Friday Night: Rain showers. Lows in the 30s. 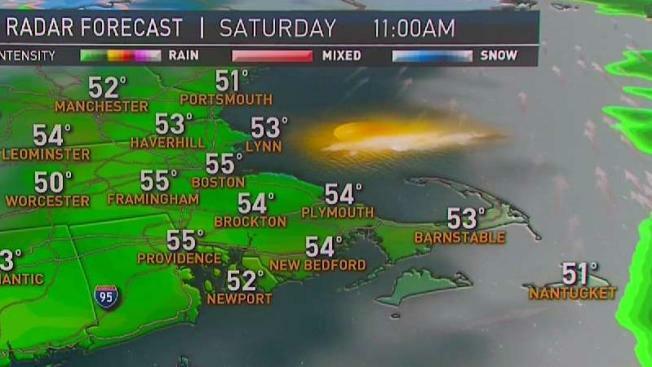 Saturday: Early morning showers to sun in the afternoon. Highs around 60. Sunday: Pleasant, mostly sunny with sea breezes. Highs in the 50s, cool coast. In true spring fashion, we’ll go from snowflakes in parts of New England tonight, to near 70 by tomorrow. A weak weather system will bring periods of both rain and snow overnight. Around Greater Boston, this will mostly fall as rain, but when the precipitation falls heavily enough a few wet snowflakes will likely mix in. From the Worcester Hills, northwestern Connecticut, and western Massachusetts, up into parts of Vermont, New Hampshire, and Maine, a light glaze of freezing rain will fall along with a dusting to 2 inches of wet snow. This will not cause major travel issues, because temperatures in most spots will stay in the 30s and 40s overnight. Saturday morning will still dawn cloudy, with a few spotty showers left over, but that will wind down 7-9 a.m. in most areas. After that point sunshine will quickly redevelop, allowing temperatures to warm into the 60s and even near 70! That’s well above average for this time of year. Sunday will bring a slow return to clouds, and a bit of a seabreeze. That means we’ll be in the 50s along the coast, with 60s again inland. Our next round of rain arrives on Monday. Right now that looks like the wettest day of early next week. We’ll still be mostly cloudy on Tuesday and Wednesday, but we’ll likely be down to more just spotty showers here or there.